With the healthcare sector accounting for a sizeable proportion of national expenditures, the pursuit of efficiency has become a central objective of policymakers within most health systems. However, the analysis and measurement of efficiency is a complex undertaking, not least due to the multiple objectives of health care organizations and the many gaps in information systems. In response to this complexity, research in organizational efficiency analysis has flourished. This 2006 book examines some of the most important techniques currently available to measure the efficiency of systems and organizations, including data envelopment analysis and stochastic frontier analysis, and also presents some promising new methodological approaches. Such techniques offer the prospect of many new and fruitful insights into health care performance. Nevertheless, they also pose many practical and methodological challenges. 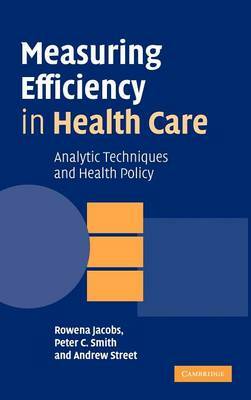 This is an important critical assessment of the strengths and limitations of efficiency analysis applied to health and health care.